Joshua Tree blog posts are a recurring theme as I find myself in the unusual desert landscape every Winter. Three years in a row I attempted to make alternative plans, and yet, each time I find myself there, turning over the new year amongst strange Dr. Seuss trees and dirtbags galore. This past winter was no exception. I had a wonderful trip, with many days of sunshine, minimal snow (though some cold temperatures!) and I managed to focus on climbing and tick off a bunch of my projects. Joshua Tree is notoriously sandbagged, and if I rate my climbing ability by grade in the park, I would probably throw in the towel and pick a different activity. Scary slabs, unusual cracks, runouts and stemming boulder problems are just a few things the landscape offers. I had a great climbing partner, my friend Thibault from France, who offered support, a belay, and climbed some harder routes for me to follow. Without him I am not sure I would have had the confidence to try the problems I succeeded on! I climbed 5.10b Illusion Dweller, an incredible diagonal crack that thins and flares and had sustained movements throughout. The top has a pumpy move over a small roof to finish, and it turned out to be much easier than I expected but I was told it was reachy and therefore psyched myself out a bit. Nevertheless, I onsighted. 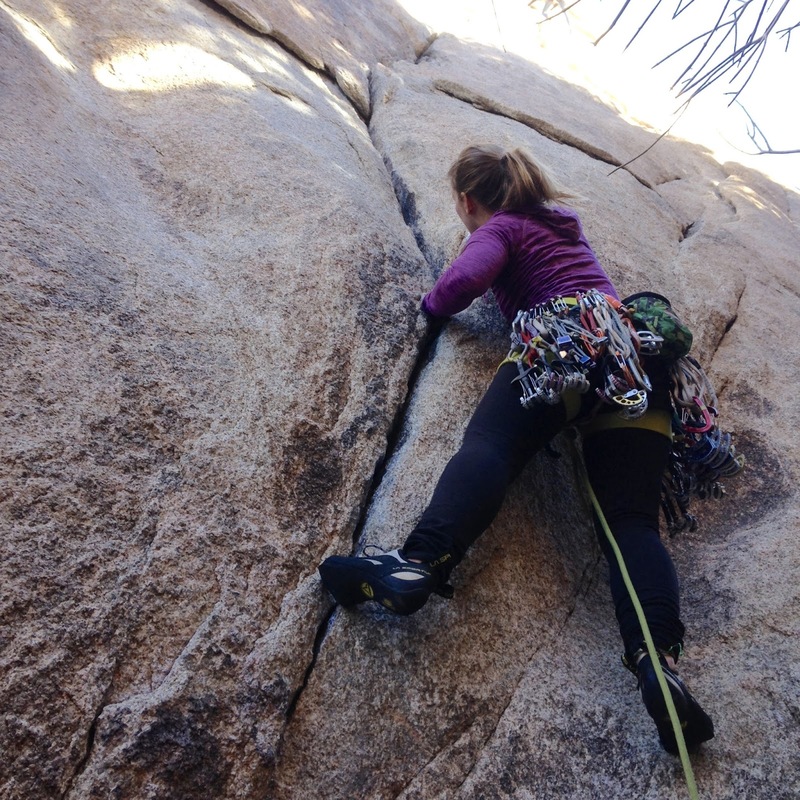 A fun, short problem was the hobbit roof, a 5.10d thats trickiest moves are on the face. This route could almost be a highball boulder problem for how short it is. Delicate face climbing up thin flakes leads to an overhanging hand crack, that feel so good to jam in. Bomber! Sent! I also climbed EBGB's, the infamous 5.10d that Lynn Hill fell off the top of. Climbers love to remember her falling off it to make themselves feel better, and I am no exception. A weird mantle starts the climb, which was especially difficult for a short girl like myself. Balancing, scary slab moves continue up the route, with a runout at the top. I had sewing machine leg, to say the least, and did not want to fall on a slab, so I didn't. Onsight. I climbed other routes that weren't on my projects list, and had to leave a few for the next winter, but I felt so good about my climbing being able to tick off such routes that had lingered as projects for a couple years. I also managed to establish my fifth highline in the park, a new and beautifully exposed line called "Worth it" on saddle rock. I was joined on this mission by the classic Mark Warren, the frenchmen Thibault and Mathieu, as well as Alejandro, Cory and Andrew. The rigging crew was Cory, Thibault and Mark. Mark, thank you for the burritos. Cant wait to project with you again! 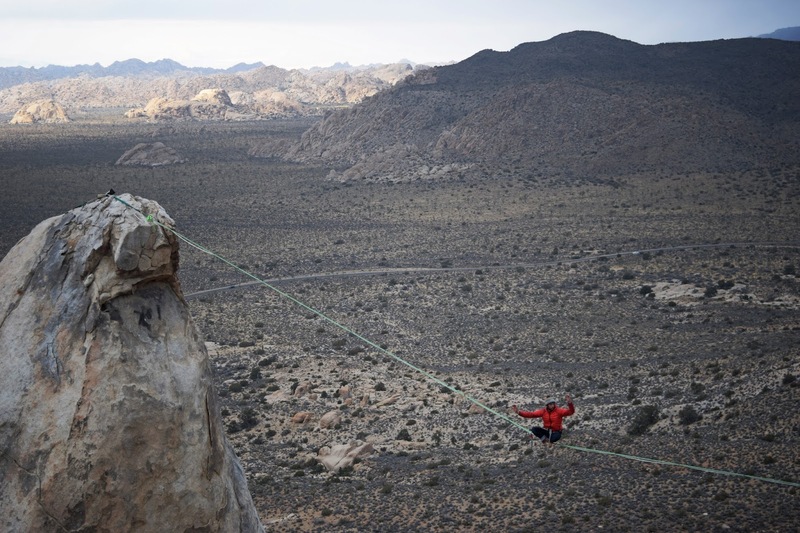 Around 140ft long, the line stretches out from a slab over the notch to the highest tower behind saddle rock. Walking in that direction you are at one of the highest points in Joshua Tree, staring at the openness of the desert and the sprinkling of boulder piles as far as the eye can see. If you want to know how the name came about, ask me in person. To access the highline, walk up the climbers trail on the left side of saddle rock. Solo up a dihedral/crack on one side to get on top of the tower, bring gear for two glue ins and extra rope or span sets to extend out, around twelve feet or so. On the other side, wear your good rubber and gingery make your way up the slab and traverse until you find two glue-in bolts just next to an overhang where the slab drops away. The bolts are close to the edge so short anchors are fine. Its best to tension from the tower side. Enjoy! Slacklining is a sport that was developed by Climbers in Yosemite Valley, California during the late 1970's and early 1980's. 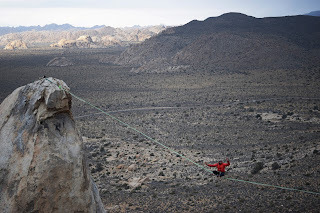 When they were not climbing, they took flat nylon webbing and stretched it between two rocky outcroppings over a void, and then learned to walk and balance on this webbing. 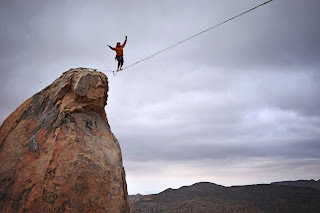 The sister sport of tightrope walking, slackline is different because the rope is dynamic; it moves with you whereas tightrope walking is on a wire or steel cable, and bends some to the weight but is not stretching with each movement. In this way, slackline requires different muscles and training then tightrope walking. The sport has evolved into different types: Longlines, which take great physical endurance as they are the most unsteady of lines. Highlines require the most mental strength, with the exposure of being so high up and having so much sky surrounding you, walking on 1" thick webbing is subconsciously frightening, even if you are attached with harness and leash to the line. 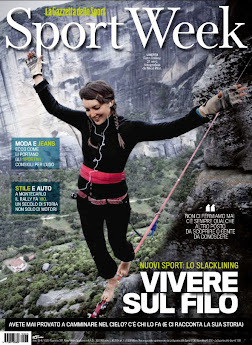 Slacklining over the ground on shorter lengths can be similar to Yoga, in the slow movements and positions. Lastly, tricklining is a tangent of slacklining, involving jumping and even flips. Overall slackline has a different meaning to each and every individual who takes part; everyone finds some philosophy in a sport of balance. It is not only an activity but a way of life. For some, slackline can lead you to some of the most beautiful places on earth, where you experience your surroundings in a way most people could never imagine. OS = onsight, aka walked on the first try. FM = full man, aka walked both directions. FS = free solo, aka no security and no attachment to the line. FA = first ascent, aka the first one to walk the line ever. Chongo = the starting position where you sit on one heel on the line before standing up to begin walking. For more updated posts, check out my Team's website! For Sure Highline from faith dickey on Vimeo. Interview- from faith dickey on Vimeo.